It is important to have your movie entries linked to the corresponding entries in our Core online movie database, because that is what gives you all automatic movie details, like cast, crew, plot description, cover art, backdrop art, trailer videos, etc..
All movie entries you add through the Add Movies screen, by searching our Core, will of course automatically be linked to Core. However, if you imported a list of movies, e.g. from a CSV file or from a competitor product, some/most of your entries may arrive “unlinked”, especially if you did not import IMDb numbers or barcodes. Previously, linking those unlinked entries to Core was a one-by-one job, slow and cumbersome. But we fixed that once and for all, with the new smart Link Movies tool! This new Link Movies tool automatically finds best matches in our Core online movie database, based on title and release year in your list. 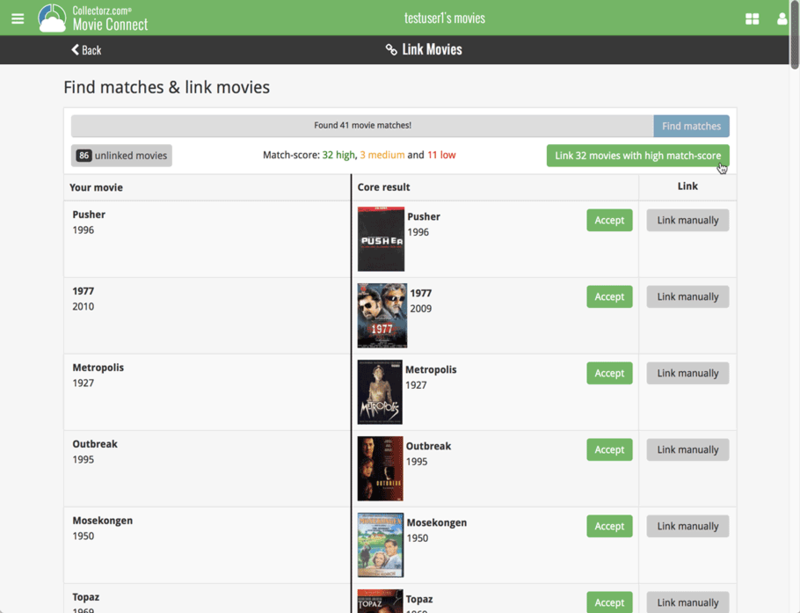 Then, it lets you auto-link all “high match score” movies, saving you loads and loads of time and clicks!